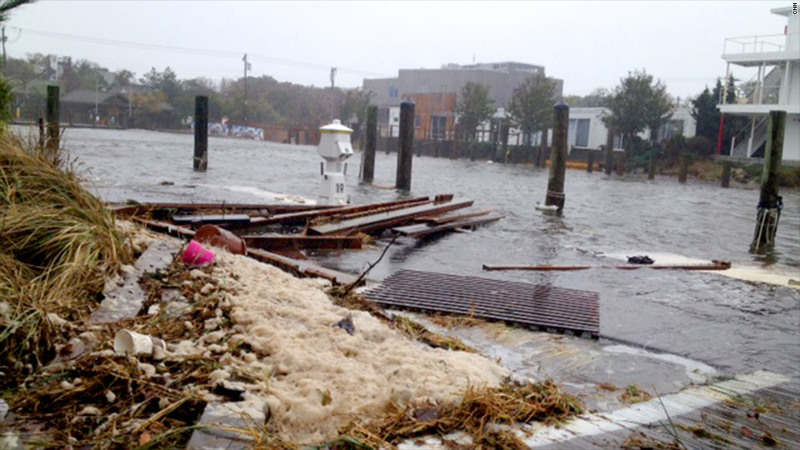 Much of Verizon's landline infrastructure on New York's Fire Island was destroyed during Superstorm Sandy and the telecom will not be repairing the old technology. Last fall, Superstorm Sandy wiped out landline telephone service for thousands of people. Many of them are never getting those landlines back. Verizon (VZ) is still in the process of repairing the telephone infrastructure that was damaged by the massive storm in late October. But in many cases, the telecom giant is replacing the old copper-based systems with new technologies -- including wireless. Those changes are coming for the industry as a whole, whether or not telecom giants like Verizon and AT&T (T) want them to. And they were coming long before Sandy struck. The parts needed to repair the old landline technology are hard to find, sending companies to some odd places to purchase equipment, such as eBay (EBAY). "It can't be that our critical infrastructure is relying on eBay for replacement parts," said Bob Quinn, head of AT&T's regulatory affairs. Manufacturers that once made the required components, such as Nortel and Lucent, have gone out of business or been bought out, noted Danielle Coffey, a vice president at the Telecommunications Industry Association. "It's not only eBay, there's a whole secondary market for these parts," she said. Related story: are landlines doomed? That's because landlines are a dying business. Many customers have switched to cell phones or VoIP services like Microsoft's (MSFT) Skype to make calls. More than 36% of Americans use cell phones as their only telephone service, about ten times the rate from a decade ago, according to a Centers for Disease Control study. Still, many telephone customers in Sandy-ravaged areas are displeased about the prospect of losing their landlines. On Fire Island, N.Y., off the southern coast of Long Island, Verizon is replacing its copper landlines with a wireless telephone system called Voice Link. The new system consists of a small modem-sized device that plugs into an electrical outlet and a standard telephone jack in your wall at home. That device connects to Verizon's wireless cellular network, which brings phone service and a dial tone to the existing cord or cordless phones in the home. Customers can use it to make calls, and it and offers services like call waiting, caller ID and voice mail. But, at least for now, Voice Link can't connect customers to the Internet. That means medical alert services often used by senior citizens will not work. Those kinds of systems allow a customer to press a medical alert button immediately contacting a monitoring center. Alarm services, fax machines, and DSL Internet won't work either. Hundreds of Fire Island residents have filed complaints with the New York Public Service Commission about the service. "It's not quite ready for prime time," said Harold Feld, the senior vice president of Public Knowledge, an advocacy group that opposes the all-wireless Voice Link system. "If we do switch to wireless as an alternative, then we want this wireless alternative to be as good or better than what we have now." Verizon offers the only telephone service on the island, so the hundreds of residents of the popular vacation spot have little choice but to accept Verizon's Voice Link plan. Verizon said it intends to improve the system as time goes on. Fire Island is a "unique situation," said Tom Maguire, the senior vice president for national operations at Verizon. Wireless is not the only path forward for swapping out copper lines for new technology. AT&T and Verizon in many cases are replacing copper with fiberoptic cable and upgrading their networks from a series of routers and switches to a modern digital network. But Fire Island isn't the only place where Verizon is installing Voice Link. The company began working on the Voice Link system well before the storm, testing it in places like Florida and Virginia as a way to connect customers without having to repair existing copper lines. In areas other than Sandy-ravaged communities, Maguire said, the Voice Link system will be available as an option -- and not every customer is a suitable candidate. It is for people who do not want DSL Internet service and do not have services like alarm and life support systems. And if a Verizon technician goes to a home to install Voice Link and there is weak cellular network signal, Verizon would in that case repair the copper wire instead of installing the wireless system. Verizon has deployed Voice Link in Mantoloking, N.J., which was also heavily damaged by Hurricane Sandy, and the company has plans to deploy it in areas like the Catskills where the copper infrastructure is badly damaged.